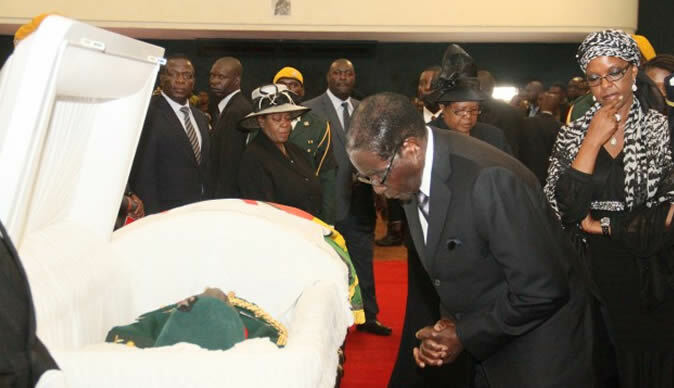 President Robert Mugabe has just finished delivering an hour long speech at the burial of national hero Brigadier Misheck Tanyanyiwa at the Heroes Acre without making mention nor recognition of the death of South Africa and world icon Nelson Mandela. Mandela died in Johannesburg on Thursday evening and as soon as news of his death made way around the world, the entire world got into a mourning mood at the loss of the world icon for democracy and reconciliation. World leaders immediately started sending messages of condolence to the Mandela Family and the government of South Africa. The world over radio, television and print media dedicated spaces and time to the life of Madiba. In Zimbabwe the public media and broadcasters were completely quite on Mandela's death for a good 36 hours prompting complaints and worries from the people of Zimbabwe. Brigadier Tanyanyiwa died in China on the 26th of November and as soon as news of his death were announced, Zimbabwe radio and TV were inundated with liberation war jingles, songs and speeches conscientising people about the late brigadier. The ZANU PF senior decision making group the politibro immediately set and agreed to accord the brigadier with a National Hero Status. While the nation was mourning the death of Brigadier Tanyanyiwa, Madiba also passed on. Expectations were high in the country that government would have immediately come in and declared concurrent mourning for the National Hero and the world icon Madiba. Zimbabwe went surprisingly silent with the president's office only sending a condolence message to President Zuma over 30 hours after the death of Madiba. Today at the heroes acre expectations were high that President Mugabe would have taken the sombre opportunity while he speaks of the local hero to tie it up with the mention of the heroism of Madiba and his influence and contribution to the liberation of Zimbabwe. The president however ignored completely the mention of Madiba in his address 90% of which was not from the written speech. It was highly expected for the president to at least make a quick reference to the condolence message which was sent to the South African government and Mandela Family. To make matters worse, not even the ZBC commentary team nor Ministers speaking behind the scenes on ZBC TV's live broadcast of the burial made any mention or statement to do with Madiba. There was not even a moment's silence provided for in the proceedings of the day to honour and show Zimbabwe's solidarity to the people of South Africa and Nelson Mandela. The world over even soccer matches and church services have been having just a moment silence to honour Madiba but not in Zimbabwe. The internet has been amassed with stories of sour relations that existed between President Mugabe and Nelson Mandela. The major highlight being the fact that the two statesmen differed greatly on the approach used in reconciling the oppressor and the oppressed after their countries' independence.